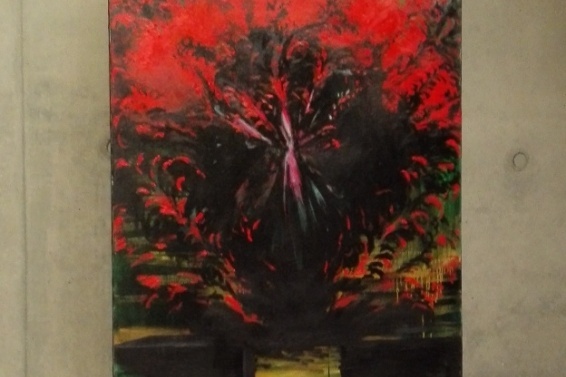 On the 19th of January, the Slovakian Institute in Berlin, opened an exhibition “3mal Berger” (“Three times Berger”) which combines the work from the extraordinary Slovak painter Jan Berger with his daughter’s, Xénia Berger. Among many paintings which were presented, the event was also enriched by the work of a musical composer Roman Berger, hence the title of the event three times Berger. Roman also belongs to the talented Berger family and his original composition “Spevy Douva” (“Mythology Woman”) was played by a pianist Ivan Buffa and sang by a powerful opera singer Denisa Slepkovska. Both artists are also of Slovakian descent and their contribution to the international musical scene is indisputable. 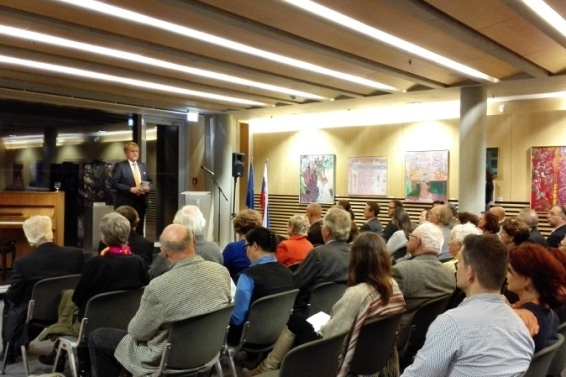 Those in attendance were welcomed by a speech from the honorable Dr. Peter Lizak, who has been Ambassador of the Slovak republic to Germany since May 2015. Jan Berger and Xénia Berger are two leading personalities on the Slovak art scene and their paintings have a very characteristic format. The unique techniques they use make their crafts unmistakable, they are full of extraordinary colors and embrace different compositions. Each of their paintings are exclusive and the motives include abstract figures, emotional reflections, and even landscapes. The works of Jan Berger can be viewed in the Slovak National Gallery in Bratislava, in the Museum of Fine Arts in Rio de Janeiro and in the European Parliament in Brussels. Alongside his artistic career, Professor Berger was lecturing at the Academy of Fine Arts in Bratislava, his teaching and experience, indeed, contributed to the raising of the new generation of artists. On the other hand, the name of Xénia Bergerová is known also in both, the national and international sphere. For instance, in 2011, she was honored, with the prestigious critics prize at "Premio international d'Arte, San Crispino", which belongs to one of the most important and famous art projects in Italy. It is essential to note, that Professor Berger and his daughter continuously contribute to the promotion of the Slovak culture. This event was organized in a collaboration between the Embassy of the Slovak Republic and the Music Centre Bratislava to mark the occasion of the Year of Slovak music from the concert series "German skies - Slovak Stars". This illustrates that Slovakia emphasizes cultural diplomacy as one of the most important themes in its international communications. The Slovak institute in Berlin is part of the Slovak centers and belongs within the framework of The Ministry of Foreign Affairs of the Slovak Republic. The institute actively promotes Slovak culture and represents Slovakia as a modern and dynamic country with a long cultural tradition and great creative potential. Its agenda supports intercultural relations at all levels as it continuously hosts programs and facilitates interactions between individuals of all cultural, academic, and professional backgrounds. Indeed, the center successfully organizes its own cultural events, cooperates with important cultural institutions throughout Germany and promotes exchange projects. The key themes of the programs of the Slovak Center in Berlin include contemporary visual arts, music, literature, documentary film, design and architecture. The Slovak center in Berlin is also a member of the Community of European cultural institutes EUNIC and the current director of the Slovak Institute in Berlin Dr. Viera Polakovičová also recently became Vice President of EUNIC Berlin for the year 2016. Since 2013, the Slovak institute has been located at the Hildebrandstr. 25, where the Slovakian Embassy headquarters in Berlin are also based. The unique architecture of the building includes multifunctional space with art galleries, a library which is open to view, and inside offices. The paintings of Professor Berger and Xenia Berger will be displayed in the Slovakian institute until 4th of March 2016.